If you’ve been paying attention to Donald Trump Jr’s social media posts on sites like Instagram over the past few days, he’s been even more unhinged and inappropriate than usual. It’s been enough to lead us to wonder if he’s known something about his impending fate that we don’t. Now it turns out the first House Intelligence Committee subpoena has his name on it. Democratic Congresswoman Jackie Speier, who sits on the House Intel Committee, revealed at a book signing last night that the committee’s first subpoena is going to Donald Trump Jr. While Speier isn’t the committee chair, she’s highly influential and politically savvy, and she wouldn’t say something like this unless the committee had already firmly decided upon it. Nor, for that matter, would Congresswoman Speier publicly reveal such a thing unless it’s coming very, very soon. Chairman Adam Schiff has already publicly stated that he and his fellow Democrats will reopen the committee’s investigation into the Trump-Russia criminal conspiracy. When the Republicans controlled the committee, they conducted a “probe” into the scandal, but purposely sabotaged their own investigation so they could falsely declare that everyone involved was innocent. So has Donald Trump Jr known for the past few days that he’s the House Intel Committee’s first subpoena target? Is this the reason for his nearly rubber-room level behavior online of late? Or has he merely sensed that the hammer was about to drop on him? 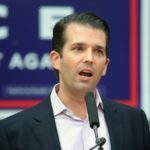 In any case, Junior is already guaranteed to go to prison for perjury, along with a whole host of treason-like charges. Even if his father manages to successfully pardon him, which is unlikely, New York state will put Junior in prison. His life is over. No wonder he’s gone completely off the deep end.